These may be my favorite Christmas cookies of all time. But I have to say that my favorite thing about them is that they don’t have to be for Christmas. Sure, the red, green, and white make them pretty Christmasy. But change up the colors, and you can have some beautiful cookies year round! Pastels in the Spring, brights in the Summer, jewel tones in the Fall. All you need is any type of sugar cookie cut into a circle, with another circle cut out of the middle. 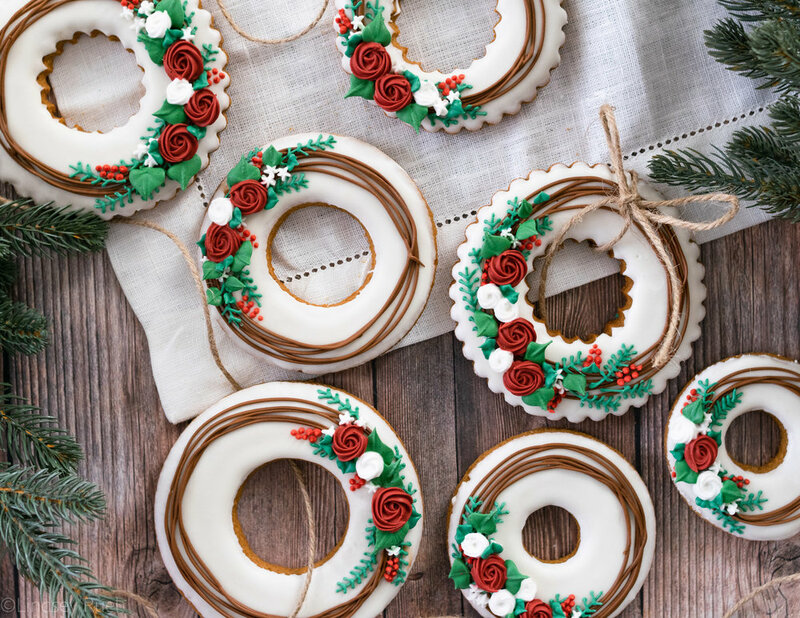 I used these biscuit cutters to get the various sizes of wreaths. Of course you will also need royal icing in various shades and consistencies. For the base of the cookie, I just dipped it in plain flood consistency royal icing to make things quick and easy. As for the supplies, I used various piping tips to create the leaves and flowers. Some came in my piping tip set and others were purchased separately. But the same effect can be made with any of the piping tips from this set. What do you think? Don’t you just want to hang these cookies up in your house or on your tree. Well, that is probably what I will do with them because they are just to pretty to eat (although, I highly encourage you to eat yours! ).